can i use dawn charm to regenerate creatures in my graveyard? Counter target spell that targets you. I assume you mean Lapse of Certainty ? It's a good add, thank you. Dawn Charm is already in the deck! Hey. 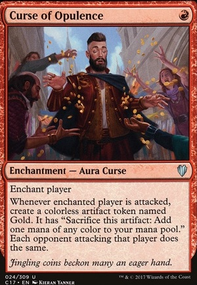 You should play the other two white counterspells: Memory Lapse and Dawn Charm . multimedia Angel's Grace !!! That's the name of it. I knew about that card, just couldn't remember the name, during spoilers I thought about comboing off with Chance for Glory to save a the loss. Funny thing, I had actually taken Glory and Godo, Bandit Warlord out of the deck. Now I know the name of Angel's Grace and, Glory is back in. I had a hard time taking Godo out, and your suggestion reaffirms the mistake I made. I completely forgot Dawn Charm exists. Hey, I like the changes and I see 100 cards. Expanding on the Sunforger package of instants in place of some equipment is a good choice. Dawn Charm is overlooked budget card with Sunforger. All it's modes are relevant and one of them is Angelsong . Angel's Grace , Chance for Glory with Sunforger and Mistveil creates an extra turn combo loop. Add in the fact that Aurelia gives you two combat steps this combo can do a lot of Commander damage or kill the table. Godo, Bandit Warlord is another one card win condition if he's equip with Helm of the Host . 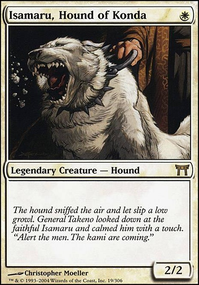 He untaps himself which means each token of him that's created with Helm untaps itself and has haste. Each time a token is created of Godo that's a new instance of him thus you get a another combat phase each time a token attacks. He can also search for and put Helm or any other equipment right onto the battlefield. This is my spellbook. I tend to find ways and effects that bend the colour pie, as well as some spells I consider "hidden gems"! This is the coolest shell I've seen yet for Approach of the Second Sun . Thank you for sharing this. You have a lot of fog effects to blank aggro, but control and combo tend to care less about those. I'd suggest maybe replacing a couple with Duress (or sideboard them, all depends on what you usually play against). If it's not out of budget range, I would suggest Timely Reinforcements . It's better than Renewed Faith as it usually gives you a bunch of chump blockers. Instead of Repel the Abominable , Dawn Charm could possibly work against burn. The second mode isn't really relevant for your deck, but the third mode directly counters a Bolt or similar (it also counters targeted discard effects, lol), and it still provides a fog effect in the first mode if that's what's needed. Helm of the Host is the card you want with Aurelia and you already have it nice. Most of my suggestions will be to strengthen the voltron strategy with equipment. When you have both these cards you want to be able to use them the turn you play them this means you need to be able to equip Aurelia for free, play Host for free, play Aurelia for free or all of the above. Playing Aurelia for free is difficult in Boros colors so lets take that away. However playing Host and equipping it for free is possible and that's a direction to consider. Command Tower : one of the best lands for multicolor Commander decks. 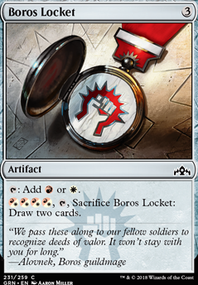 Battlefield Forge : ETB (enters the battlefield) untapped. Mistveil Plains : excellent with Sunforger. 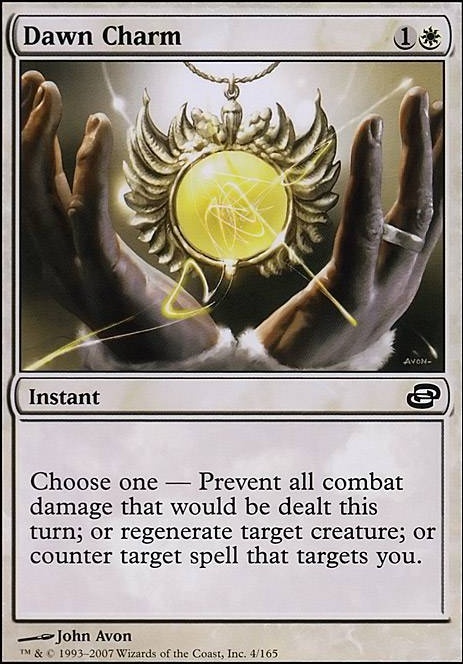 Sol Ring : most played card in Commander. Godo, Bandit Warlord : another two card win with Host. 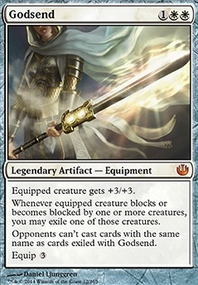 Sigarda's Aid : play Host at instant speed and equip it to Aurelia for free. Smothering Tithe : great repeatable ramp in multiplayer Commander. Sunforger : lets you search for and cast an instant for free. Mother of Runes : protect Aurelia. Mistveil Plains: can put a card that's in your graveyard after you cast it for free with Sunforger back into your library and then cast it again. This land lets you loop spells with Sunforger. Knight of the White Orchid : search for Mistveil or a Plains and put it onto the battlefield. Gift of Estates : search for Mistveil and other Plains. Helpful to make land drops. Argivian Find: recur an artifact or enchantment. Eerie Interlude : save your creatures from a board wipe get more value from creatures with ETB abilities. Wear / Tear : can combine and use both Wear and Tear when casting it with Sunforger. This is an example of a simple base Sunforger package; it can be expanded on and made much more complex. If you like some of these suggestions then I offer help to make cuts and if you have any questions feel free to ask. Good luck with your deck. drakendark Lookin good...I think you will like Harsh Sustenance , it will win you some games. As far as side board, decks like this are very prone to heavy burn... Electrickery is a staple in Pauper and could ruin you day. My side-board choices for decks like this usually involve lots of protection, for example: Circle of Protection: Red , Apostle's Blessing , Prismatic Strands and Hallow are a few examples that I use. PS Dawn Charm is a good choice also, very versatile card!